We are so delighted to welcome ZBS Media back to The Fictional Cafe with “The Maltese Goddess,” an entertaining and original takeoff on Dashiell Hammett’s novel, The Maltese Falcon. Not only is the script first class, but the ZBS Artistes have added two extraordinary aspects to this storytelling. One, from time to time the main characters break into song. And not just any song, like a pop diva, but operatic song in which the character is singing their lines from the script! 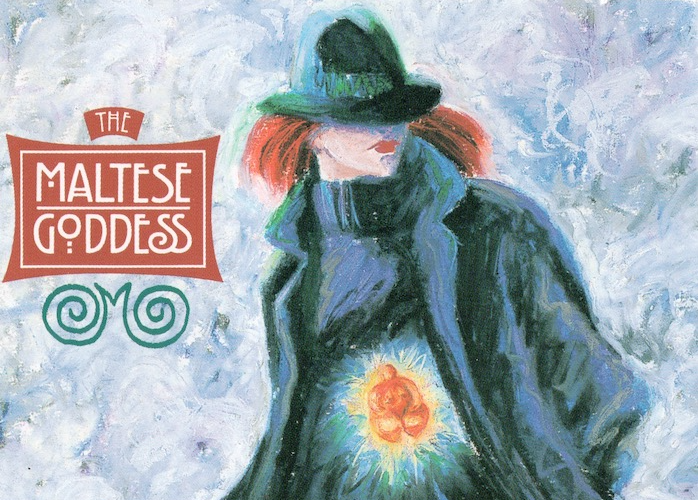 They call “The Maltese Goddess” a detective opera. It’s just great, and even if you don’t think you like opera, I think you’ll like this. Ha-Ha! I’ll bet you’re saying you still don’t know what 3-D sound is, so I’ll explain it myself. It’s as if you are right there, in the middle of everything. People talking and external sounds [i.e. FX] all around you. To experience 3-D sound in all its richness, I highly recommend – to the point of insistence – that you listen to “The Maltese Goddess” wearing headphones. While I was listening, I walked through my living room, whose outside door was open at the time. I heard some people talking and was certain I had company, but when I whipped around to look, no one was there! It was the 3-D sound in my headphones!! So without further palaver, here is the Introduction and Part I of ZBS’s “detective opera,” the Maltese Falcon — er, I mean, “The Maltese Goddess.” Parts 2 and 3 follow on consecutive Saturday nights. The last time we played a ZBS production, we got 22 Comments.